Frederick Hand Firth of Place, Ashburton, died on the October 18th 1903. His sons Frederick William Firth, Henry Mallaby Firth and the Rev Walter Firth obtained probate for an estate that totalled £27016 0s 11d gross. His wife Caroline was mentioned in the will, plus additional sons Sidney and George Septimus, and daughter Mary Nina. Mr Firth was formerly of Cator Court, Widecombe. See also Henry Mallaby Firth under Attorneys, a sub-menu of Banks and Businesses. Henry Mallaby Firth was baptised in Wittan, Cheshire in 1852, the son of Frederic Hand and Mary Firth. 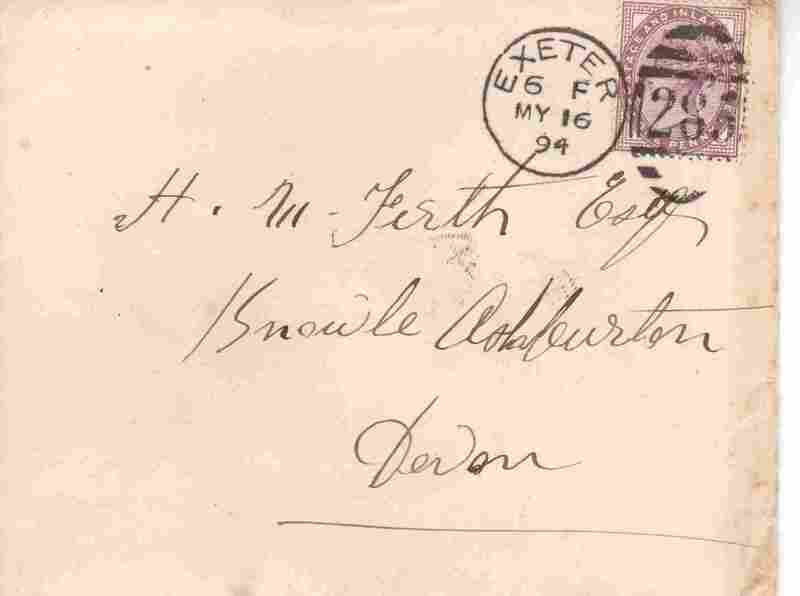 He was an articled attorney clerk in Lewisham in 1871, and married Frances Caunter in Widecombe parish church in 1877. At the time of his marriage his residence was Cator Court, Widecombe. Frances was the daughter of solicitor George Caunter. In the 1891 census Henry Mallaby Firth, solicitor, is shown at The Knoll, Ashburton. Forty years old, he is living with his wife Frances, three children and three servants. In the same census Frederic H Firth, 66 and a JP living on his own means, is living at Place House. He was also born in Cheshire. Left and below: H M Firth lived at Knowle, Ashburton. 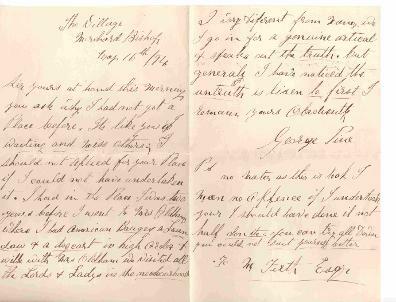 In 1894 George Pine wrote him a letter about employment. could not have undertaken it. I had in the place I was two years before I went to Mrs Oldham, where I had American Baugey a Laundaw & a dogcart in high order & wille with Mrs Oldham we visited all the Lords and Ladys in the neibourhood I very different from many. We I go in for a genuine artical & speaks out the truth. but generaly I have noticed the untruth is lisen to first I remain yours obediently, George Pine. To H M Firth Esq. In 1903 Mr Firth appealed against the reassessment of the rates for The Knowle, which had gone up from £65 to £75 - he thought a figure of £50 more appropriate. As evidence to Newton Petty Sessions, he said that he had leased the property from Sir Robert Jardine before purchasing it, paying a rent of £89, but that had included a cottage that was now rated separately. The assessment had been raised by £5 in 1892, when he had added two rooms at the back. He claimed that the property was just an old farmhouse, without modern luxuries such as hot and cold water or gas laid on. The house had no bathroom, and the bedrooms were only 7ft 10 and a half inches high. The Bench questioned My Firth on why he would not allow a valuer into the house, and after retiring to consider their decision, dismissed his appeal. The Market Hall, including the pannier, fish and corn market, was up for auction in 1915. With it came the Lordship of the Manor of Ashburton. Bidding started at £500, and it was eventually bought by Mr H M Firth of Knowle, for £1400. Henry Mallaby Firth, lord of the manor of Ashburton, died at Knowle in March 1926. He was 74. Mrs Frances Firth, widow of Henry Mallaby Firth, died in November 1929, aged 84. 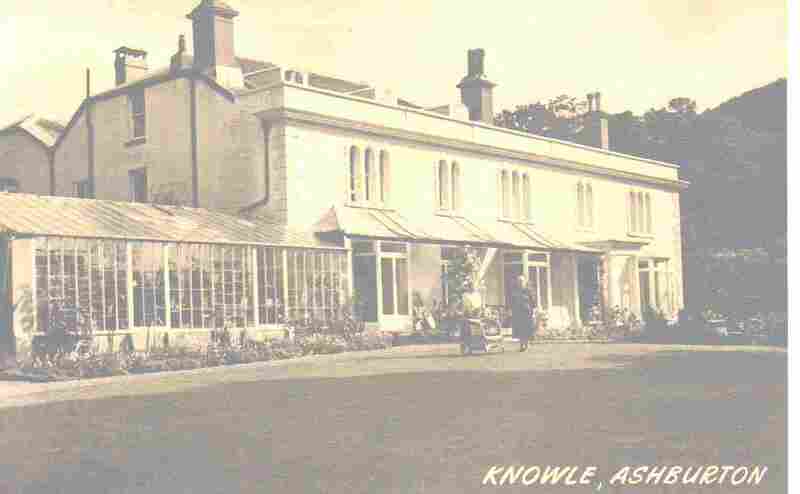 In 1930 Michelmore, Loveys and Sons had instructions to sell 'valuable furnishings' at Knowle, Ashburton. The vendor was not named. Cecil Mallaby Firth was baptised at Ashburton on August 14th 1878. He was the son of Henry Mallaby Firth, gentleman, and his wife Frances. When James Woodley of Halshanger died in 1894 Cecil Mallaby Firth, at that time under age, was his nearest male relative. In 1906 the Kent and Sussex Courier announced that the marriage between Cecil Mallaby Firth and Freda Hansard would take place quietly at Frant. Cecil Mallaby Firth and Winifred Nest Hansard married in the September quarter 1906. Winifred, the daughter of Septimus and Edith M Hansard, was 11 days old at the time of the 1871 census. Her father was rector of St Matthew, Bethnal Green. 1871 census RG10, piece no. 496, folio 60, p27. 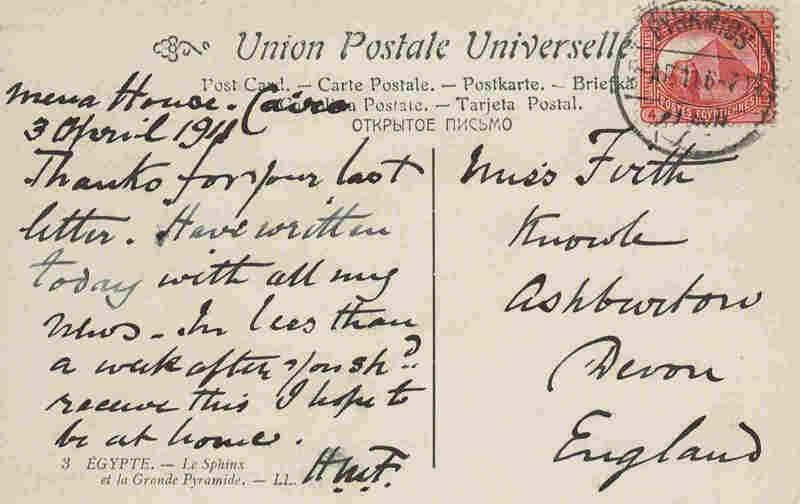 Above and right: A postcard sent by HMF to Miss Firth on 3rd April 1911. He was at Mena House, Cairo - now, as then, a hotel. The Commander-in-Chief of the Egyptian Expeditionary Force 'mentioned' Cecil Mallaby Firth, a Temporary Lieutenant in the Intelligence Corps. 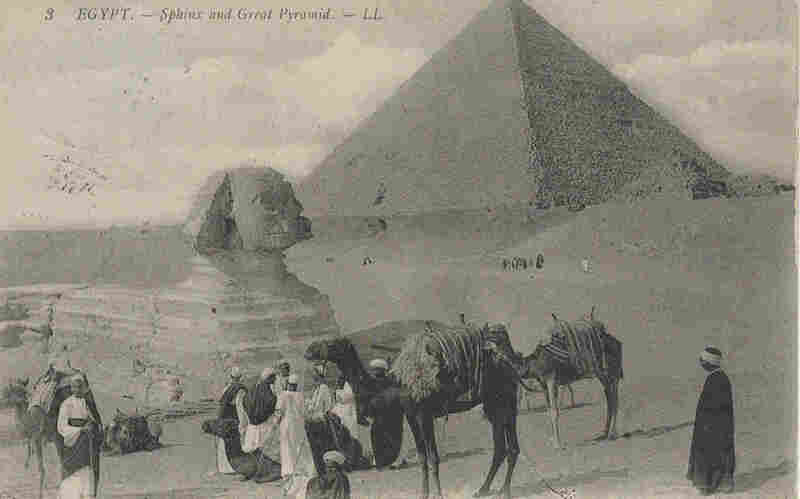 Cecil M Firth and Battiscombe Gunn published Teti Pyramid Cemeteries, a 2 volume work on excavations at Saqqara, in 1926. With James E Quibell he published, in 1935, The Step Pyramid, a 2 volume work also on the Saqqara district. Mrs Cecil M Firth executed a drawing of skeletal tuberculosis in Nespaheran, an Egyptian priest of Amun from the 21st dynasty. The drawing 'is now a classic'. Cecil Mallaby Firth died in a London nursing home in July 1931. Returning home on annual leave from Egypt, he was taken ill on board ship, and developed pneumonia shortly afterwards. Mr Firth had worked in the Egyptian Intelligence Department during WW1, and had worked with the Egyptian Government on archaeological digs for many years, discovering 5000 year old tombs in the Saggara district. His wife and daughter usually spent the winter with him in Egypt. Mr Firth owned Bradley Manor and part of Bradley woods, and during his excavations and researches there had discovered the original altar stone being used as a gatepost. He also owned Rowbrook, near Poundsgate, and several Ashburton farms. On the 31st October Winifred Firth and Diana Firth sailed from a London port, travelling to Port Said. They travelled 1st class. Probate for Cecil Mallaby's estate, which amounted to £13,281 net, was granted to his widow, Winifred Nest Firth, and his daughter Diana Helen Firth. Mr Firth was said to be of Bradley Manor, Newton Abbot, Roughbrook, Widecombe, and Sakkarah, Egypt. He divided his property between his wife and daughter, and left some manuscripts and early books to the Bodleian Library, 'in memory of my service there'. His burial wishes were that he should be interred near to his father and brother in Ilsington churchyard, or if his wife had pre-deceased him, to be near her. Winifred N Firth died in the December quarter of 1937, and her death was registered in the Newton Abbot registration district. She was 66. The following year Diana Firth gave Bradley Manor, a 15th century manor house, to the National Trust. According to the Exeter and Plymouth Gazette, the Firth family had owned the property since 1909. Cecil Firth, the 'eminent Egyptologist and explorer' had spent the rest of his life restoring it; a task that was continued by his wife after his death. Miss Firth hoped to continue to live in the house.